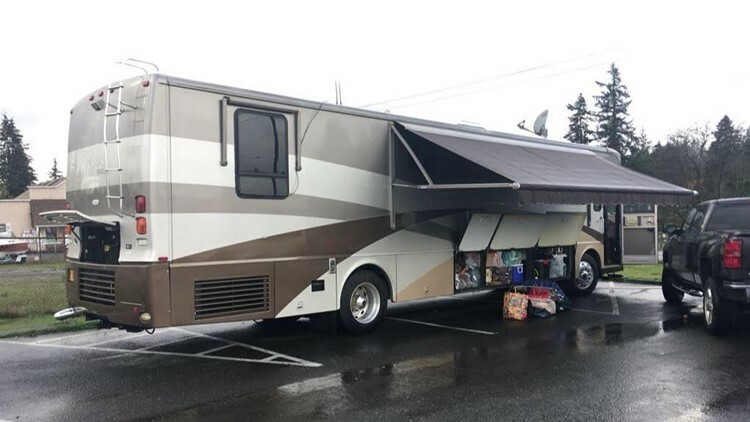 Beavercreek Saloon owner Patrick Whitmore is giving his motor home to a single mother who lost everything in the Camp Fire. He and his partner, Barbara Brooke, are also driving down a bunch of donations to hand out to victims of the massive Northern California fire. A community is coming together, giving what they can to people who've lost everything in Northern California’s Camp Fire. It's now 100 percent contained, but not before leaving behind widespread destruction. Eighty eight people have died with more than 200 people still missing. Because so many are without so much, the owners of the Beavercreek Saloon in Beavercreek decided to do something. On Tuesday morning, they were getting ready to hit the road with a motor home filled with donations. “We have dishes, pots and pans, toilet paper,” said Patrick Whitmore, who owns the Saloon with his partner, Barbara Brooke. He said when he heard about the devastation in Northern California, he began thinking about how he could help. “I woke up about a week ago thinking I wanted to share my motor home with somebody in Paradise because it was just resting in my barn and I didn't have any plan or any use for it,” Whitmore said. Soon after he had that thought, someone walked into his saloon. “I said, 'Welcome to my restaurant, where do you live?' and the gal said, ‘I live in Molalla, but my friends here are from Colorado and they're on their way to Paradise to volunteer,'" Whitmore said. He gave them his number in case they ran into someone who needed his motor home. Then on Thanksgiving day, Whitmore got a call. He heard a woman in California named Veronica, a single mom with three kids, had been asking around for an RV. He's excited his motor home will help someone, along with all the donations that have poured in starting last Friday. He said each box, each bag, and the entire motor home is filled with love. Whitmore said he, along with Barb, his dog Duke, and his favorite cousin Jerry plan to pack into the motor home to deliver the donations to people who need them. “I'm happy I can do it. I'm happy I can do this one little thing,” Whitmore said.